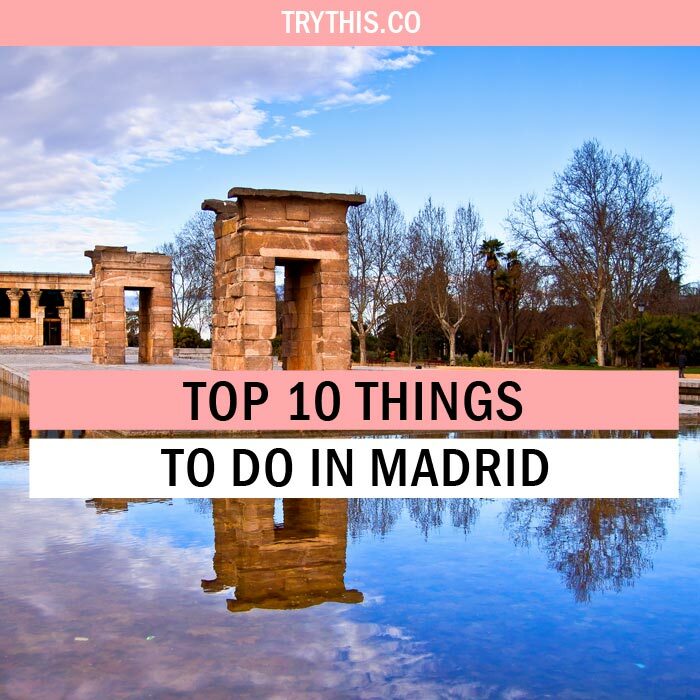 Top 10 Things To Do In Madrid - Travel Tips - TryThis! 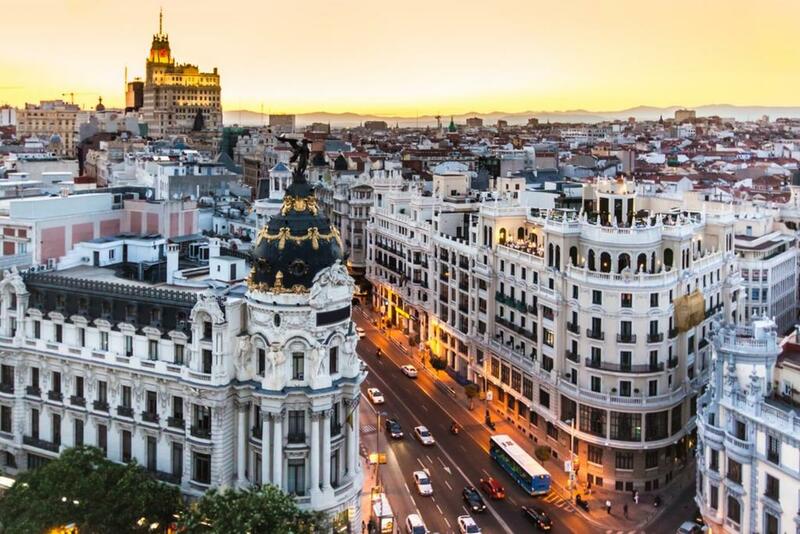 Feel the pulse of spirited Spain and enjoy all things arty in the sassy central capital, Madrid. Start your vacation in Madrid, the cultural and economic heart of Spain. Madrid is a city known for its food, its streets filled with boutiques, and its historical monuments. Make your way to Retiro Park and take a pleasant walk around the lake and fountains. Then pay a visit to the Prado Museum. 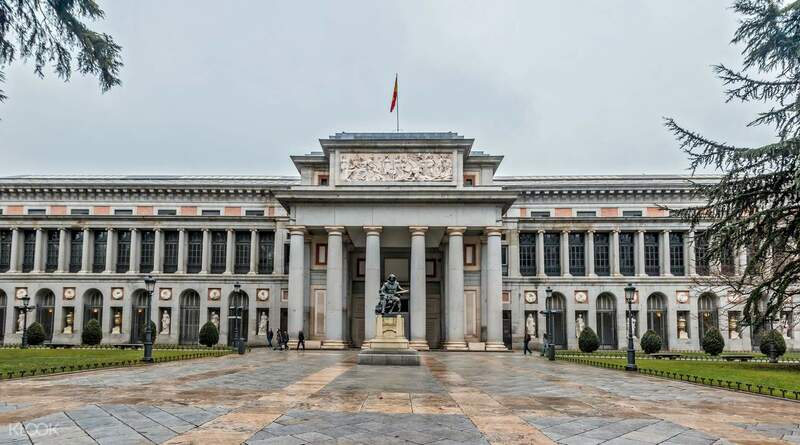 With over 20,000 exhibits, including works by Diego Velazquez, Goya, and Titian, it has one of the most extensive collections of European art in the world. If you are feeling peckish after all that art, you can grab a bite of Madrid’s exquisite tapas. Madrid offers visitors a taste of the best dishes Spain has to offer, all in one chaotic, quintessentially Spanish foodie playground. Madrid’s food scene is in constant evolution, yet still rooted in tradition. While creativity abounds and twists on the old favorites are praised in some restaurants, others pride themselves on serving typical dishes the ‘right’ way – the same way their grandmothers have been serving them for generations. Come visit this gem located in central Spain, soak up some sun, and don’t forget the obligatory tapas tour around the city center. It is easy to fall in love with Madrid because it is full of character. Therefore, exploring things to do in Madrid can be really confusing when in the city. 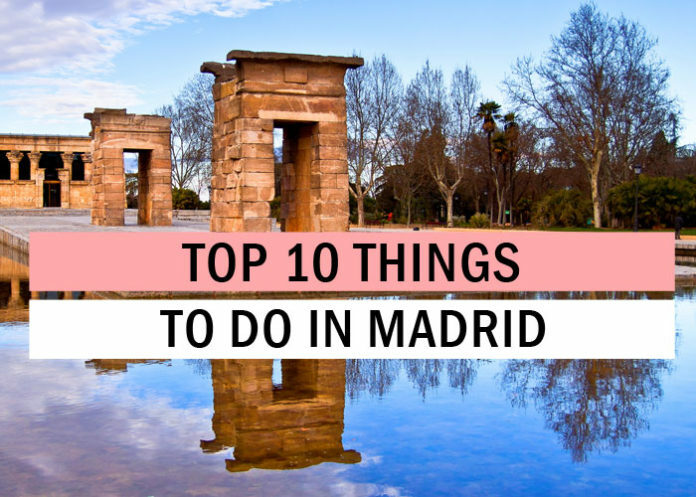 The place is young, dynamic, and volatile and hence, here is a list of top 10 things to do in Madrid. 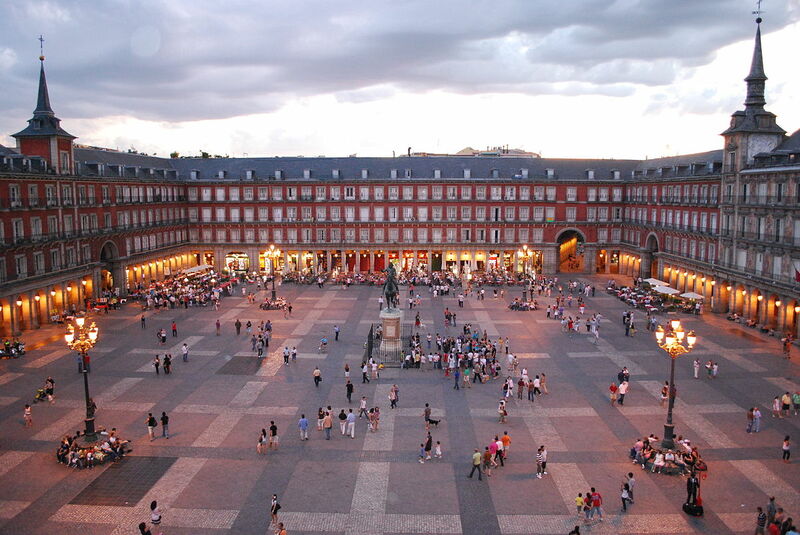 Plaza Mayor is the central square that is a popular meeting place for tourists and locals, but its history goes back to the early 17th century during King Felipe III’s reign. The central statue is a nod to the king’s role in overseeing the project’s completion. Forming the outer walls are a series of 3-story buildings with balconies overlooking the center. Plaza Mayor has played host to a variety of festivities throughout history, including bullfights, executions during the Spanish Inquisition, and soccer matches. The most prominent of the buildings in the plaza is the Casa de la Panaderia, or House of the Baker’s Guild, which today serves municipal and cultural functions. This is the first one of the things to do in Madrid. Lined with high-end shops, restaurants, and bars of all types, Gran Via cuts through the heart of Madrid. The bustling street comes alive at night when locals eat, drink, and mingle into the wee hours. Gran Via is also known for its 20th-century architecture, including the Edificio Metropolis, which stands at the head of the thoroughfare and boasts a magnificent rooftop statue of Winged Victory. While primarily known as a shopping and bar-hopping street, there is plenty more to do on Gran Via. Sample cocido madrileno (chickpea-based stew), Madrid’s most famous culinary specialty, at one of the area restaurants, catch a film in an art deco movie house, tour the art collection at Convento de las Descalzas, or spend some time people-watching in the always bustling Plaza Espana. This definitely is the next best thing to experience among the many other things to do in Madrid. Commissioned by King Felipe II as a testament to Spain’s devout Catholic faith, El Escorial was built in the 16th century after the French were defeated in the Battle of Saint Quentin. The highlights of this immense UNESCO World Heritage Site is considered the most important monument of the Spanish Renaissance and it includes the elegant basilica; the marble Pantheon de Los Reyes, where many kings and their relatives are buried; and the Patio de Los Reyes, the entrance to the monument; topping the list of things to do in Madrid. 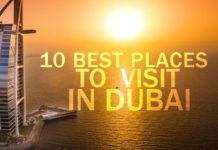 The site is a must-visit for history buffs and architecture lovers. The famous royal monastery is frequently combined with either a tour of the Valley of the Fallen (Valle de Los Caidos), a trip to the city of Toledo, or a city sightseeing tour of Madrid. 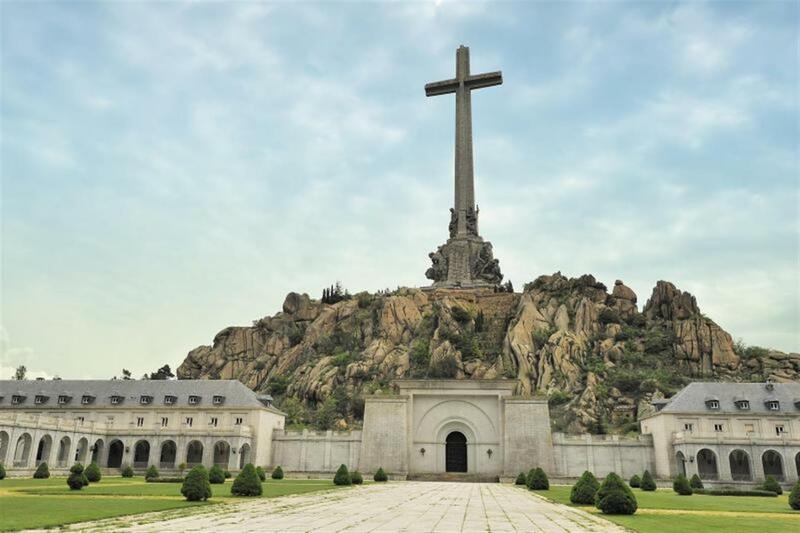 This monument was built under dictator Francisco Franco’s direction to honor those who had died in the Spanish Civil War. For a moving experience, check out the immense cross atop the mountain and marvel at the mosaics in the basilica, where Franco was laid to rest. Madrid’s Royal Palace, also known as the Palacio Real or Palacio de Oriente, is a beautiful baroque structure, making it one of Europe’s largest castles. Although the royal family no longer lives here, the Palacio Real still serves as the king and queen’s official residence, a venue for state ceremonies, and a place for tourists to get a peek into the royal history of Spain. This most definitely is next in line for the things to do in Madrid. The Royal Palace of Madrid is open daily, and citizens enjoy free admission, while other visitors pay a small fee to go inside. Travelers can explore independently, hire a tour guide, or rent an audio guide upon arrival. For a truly royal experience, you can secure exclusive early access to the palace opens. There is a lot to see beyond the palace walls, so be sure to carve out a few hours to see the rest of the area. Just across the courtyard from the Royal Armory is the Almudena Cathedral, and beyond the gates are the free Campo del Moro gardens and Sabatini Gardens, the place is one of a kind and reigns the itinerary of the things to do in Madrid when in the city. The Prado Museum or Museo del Prado houses one of the finest art collections in the world, specializing in European art from the 12th to 19th centuries. 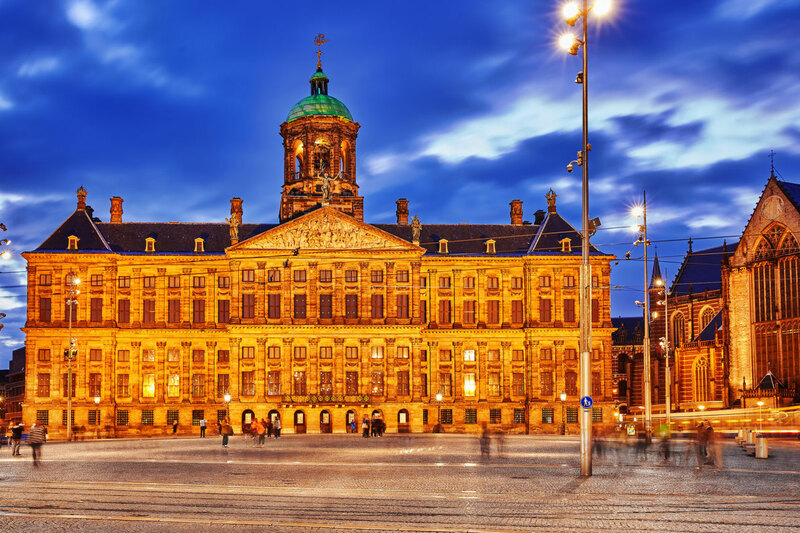 Thousands of European paintings, sculptures, and other works of art are on display throughout its halls, and they represent merely a fraction of the total collection. Highlights include works by Francisco Goya, Diego Velazquez, and El Greco. Perhaps the most famous paintings are “Las Meninas”, an inventive self-portrait by Velazquez, and The Garden of Earthly Delights, a triptych from Hieronymus Bosch. The Prado is to Madrid what the Louvre is to Paris, and that means just about every visitor to the Spanish capital makes a stop here. This makes up for one of the many things to do in Madrid. In 1785 King Carlos III commissioned the Prado as a natural science museum to accompany the neighboring botanical gardens. When it opened in 1819, however, its purpose had shifted to display an extensive art collection gathered by Spanish royals. If you are wondering what other things to do in Madrid next, then Parque del Buen Retiro should be the place of your choice. Parque del Buen Retiro – or Park of the Pleasant Retreat – is Madrid’s most expansive park and landmark. 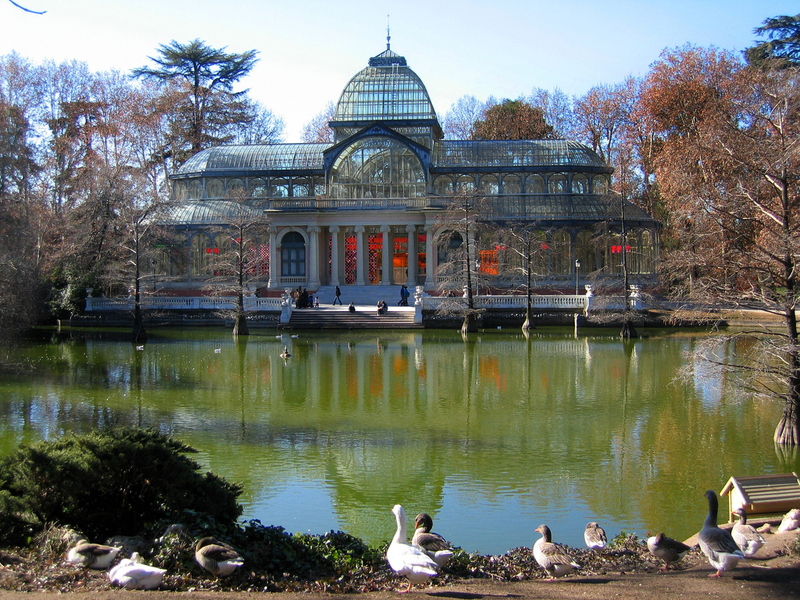 Known locally as just “El Retiro”, the park is referred to as “The Lungs” of Madrid, providing the majority of the greenery to feed off of the carbon dioxide of urban life and release enough oxygen to keep its many residents and visitors alive. One of the city’s most popular attractions, Parque del Buen Retiro is filled with numerous statues, gardens, galleries and a beautiful lake. People go to meet with friends, to read or picnic, and to admire the art, both indoors and out. You can even rent yourself a boat to paddle around the lake. During the warmer months, also be sure to catch the free concerts in the park every Sunday afternoon. Originally the property of the royal family, El Retiro still has palaces on its grounds. These have since been transformed into museums hosting Spanish art and army artifacts. The park is also home to monuments commemorating King Alfonso XII and the victims of the Madrid train bombing in March 2004. 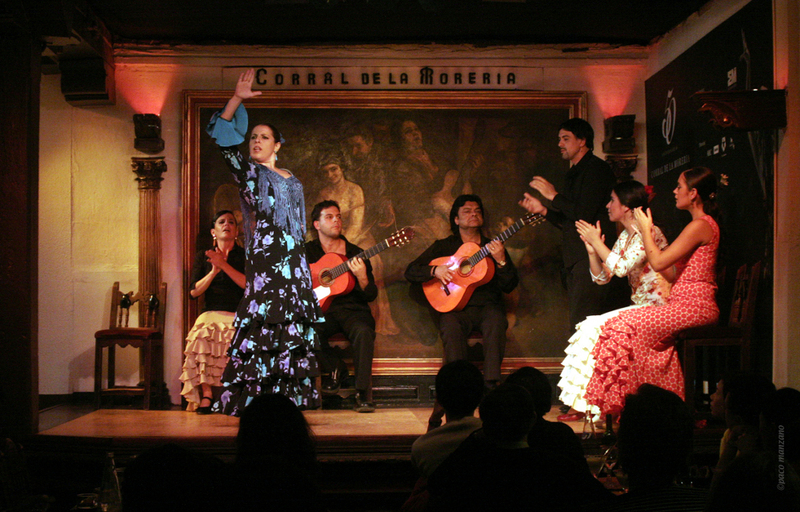 As one of Spain’s most famous tablaos (flamenco clubs), the Corral de la Moreria in Madrid has been producing flamboyant and moving flamenco performances for nearly sixty years. Thanks to its reputation, the Corral de la Moreria attracts its fair share of world-renowned dancers as well as the occasional A-List celebrity spotted among the audience. With seating around individual tables, the club feels intimate and cozy, furnished in simple rustic style and with great views of the small stage from all sides. This makes up for one of the many things to do in Madrid. 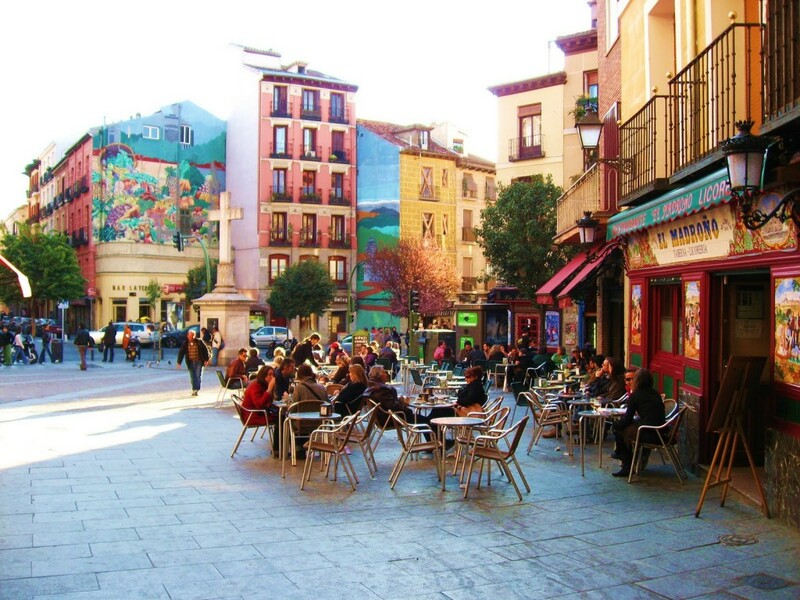 Located in the center of the city, La Latina is one of the most authentic neighborhoods in Madrid. Medieval roads wind around Plaza de la Cebada and Plaza Paja, and this district was once inside of Madrid’s first city walls. Some remains of the walls can still be seen. The area was once occupied by artisans and manual workers, which influenced the names of the two main squares and most definitely dominates the charts of things to do in Madrid. Cebada means barley and Paja means straw, and these squares were once home to busy markets. 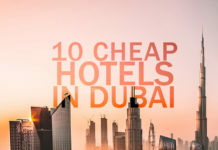 This is a popular district for locals who enjoy frequenting the many bars, pubs, and traditional taverns located here, making for lively nightlife. During the day, be sure to check out the Basilica of San Francisco el Grande and the park of Las Vistillas. The park offers wonderful views of the sunset against the Cathedral of Santa María Real de la Almudena. La Latina also has plenty of options for flamenco and tapas which are a must try when in the city and thus seamlessly fits in the list of things to do in Madrid. 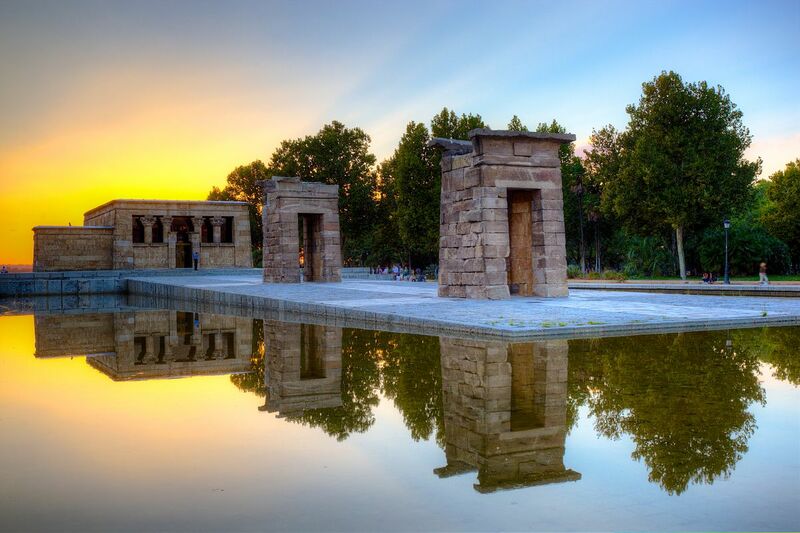 The Temple of Debod, an Egyptian temple built in the 4th century BC, stands in Madrid’s Parque de la Montana near Plaza de Espana. While it may seem out of place in the middle of the modern city, the temple was dismantled, shipped, and carefully reconstructed here in 1972 to protect it from flooding caused by the construction of the Aswan Dam. Spain received the temple as a thank you for helping to save Abu Simbel, another archaeological site that was threatened by flooding in Egypt. The ancient temple stands behind two stone gates rising out of a calm shallow pool. Inside the temple, there are hieroglyphs as well as photos documenting its history, including the reconstruction in Madrid. The temple and gates are illuminated at night, creating a clear beautiful reflection of the structure of the water and makes up as one of the many things to do in Madrid. 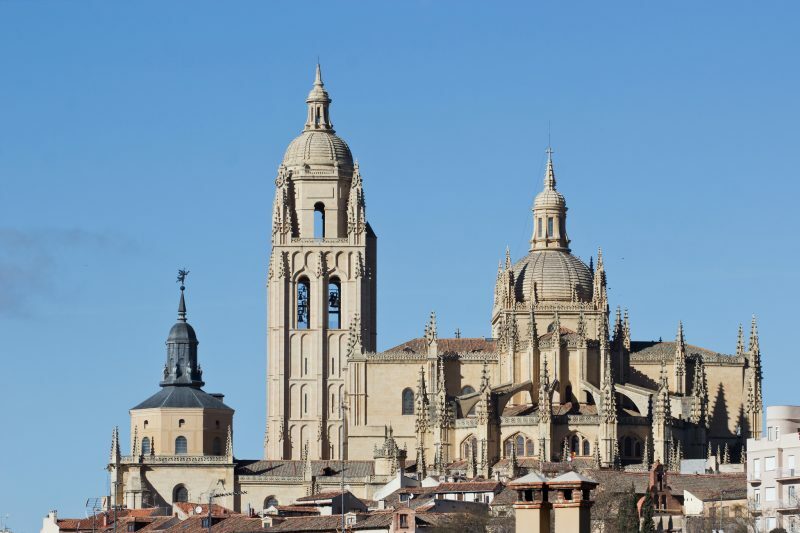 Segovia Cathedral is the last Gothic cathedral to be built in Spain. Fronting the historic Plaza Mayor in Segovia, it stands on the spot where Isabella I was proclaimed as Queen of Castile. Segovia Cathedral has a supremely Gothic exterior combined with a surprisingly bare interior but contains numerous treasures. The interior, illuminated by 16th-century Flemish windows, is light, bare and uncluttered, with a large Gothic choir (15th-century, predating the cathedral) placed in the center. The museum contains jewelry, paintings, and a collection of rare antique manuscripts and makes up as one of the many things to do in Madrid.